When did the Devil Rays uniforms start to look good? When the team was first announced as an expansion team back in the 1990s, I was not a big fan of their uniforms. These looked ridiculous. The Rays brought them back last year as part of their 20th Anniversary. Suddenly they looked half way decent. 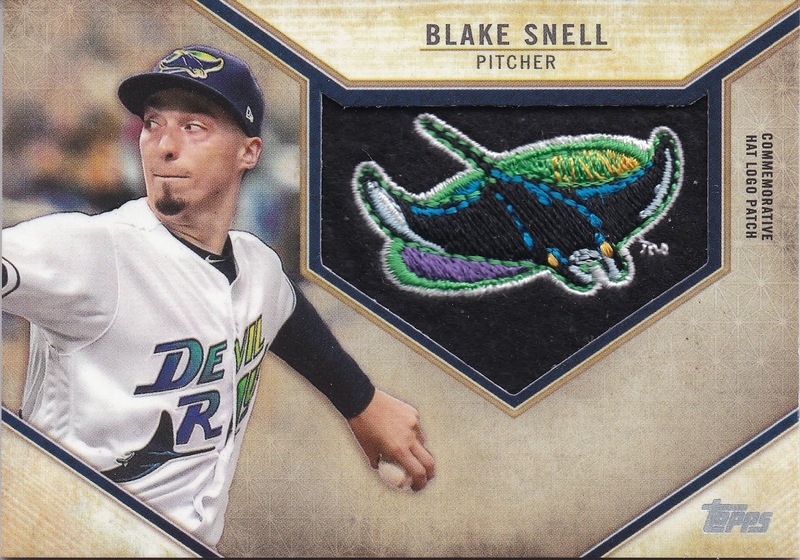 Nice enough that I went out and got a card of Blake Snell with the old Rays logo. What has changed over the last twenty years that has made these more appealing? Maybe it is the players. 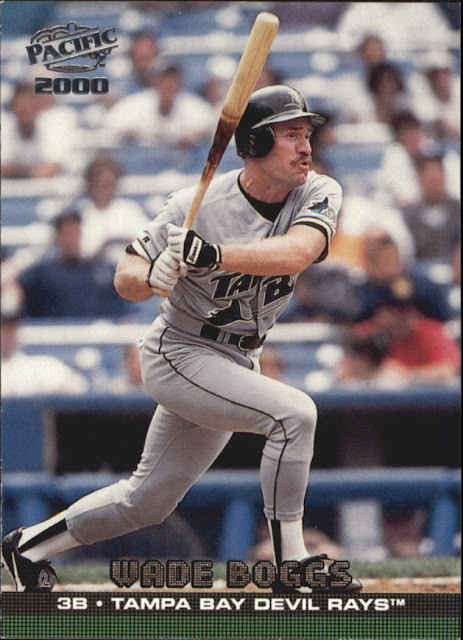 Twenty years ago the Rays were overcrowded with old guys who were past their prime. Wade Boggs, Wilson Alvarez, and Vinny Castilla. Most of the current Rays were on the Durham Bulls at some point. It is hard to go against players you spend time watching. I draw the line at Blake Snell wearing a Cubs or Yankees uniform, but that might have some influence. The hats are also different. The bottom card has a TB over the ray, the Snell card just has the Ray. Little cleaner look. Back to the Snell card for a second. I know that the manu-patch card is tired and old, almost as much as relic cards, but there are still nice ones every once in awhile. The Topps manu-patch cards in this year's Series 1 cards are supposed to be old "retro" hat logos. It works well on the Snell card. I also got the Yadier Molina card from the set. Yeah. The Cardinals really do not change much. At least the picture came from a game where the Cardinals were wearing their old 1970s/1980s polyester road uniforms. Morton was primarily a fourth outfielder for the Tigers, Braves, and Angels during his seven year Major League career. His final three years were easily his best, where he earned the reputation as one of the best pinch hitters in baseball. While Morton's Major League career seems ordinary, he is an important figure in the history of the Durham Bulls. Morton, along with pitcher Ted Radcliffe, became the first African-American players for the Bulls in 1957, appearing in an April 18th game against the Greensboro Hornets. Bubba Morton went on to become a Carolina League All-Star that season hitting .310 with 18 home runs. 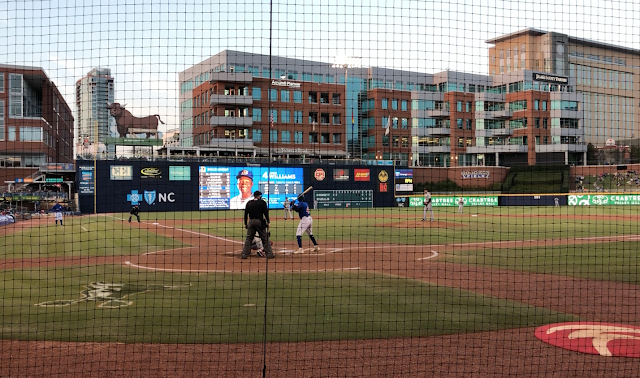 The Bulls ended the season in first place capturing the Carolina League title. After retiring, Morton moved to Seattle where he became one of the first African-American college baseball coaches. He coached the Washington Huskies for five seasons before the university ended their baseball program due to financials problems in the athletic department. Morton cards are obviously not very expensive, so I went more on style and team than anything else. 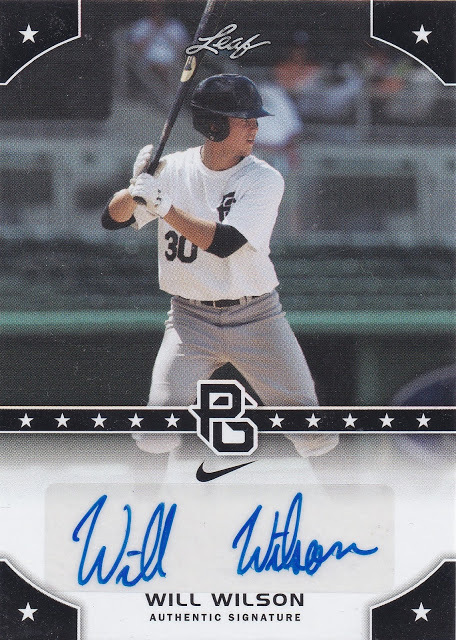 I decided that I would rather own a Tigers card of the former outfielder, that was the team the Bulls were affiliated with at the time Morton playing, than an Angels card. It came down to a decision between the 1963 and the 1962 Topps cards. Is there really a wrong choice? I actually ended up with both, but I put the 1962 card at the top of the post. Here is the 1963 card. The 1962 Topps card is obviously in better shape, although the centering is a little bit off. 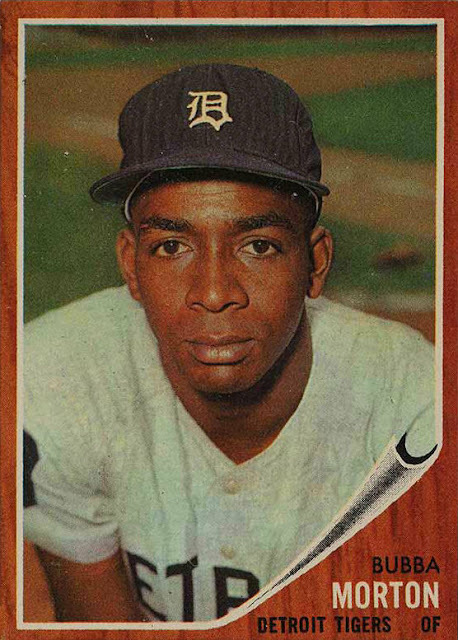 The 1962 Topps card is also Morton's rookie and one of the short printed cards in the set. Again, both great cards, happy to have both in my collection. 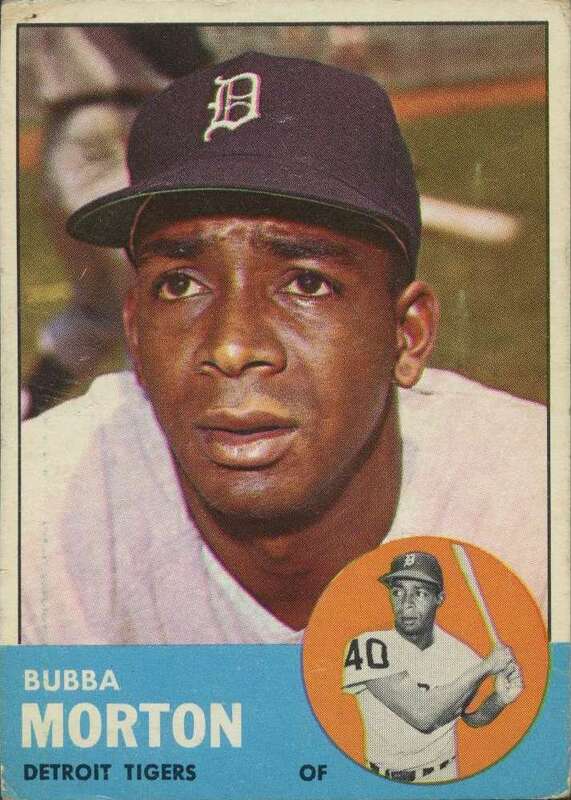 Since it is Jackie Robinson Day, I thought I would do the last Cardinals player who wore 42 prior to Major League Baseball retiring the number across the game. 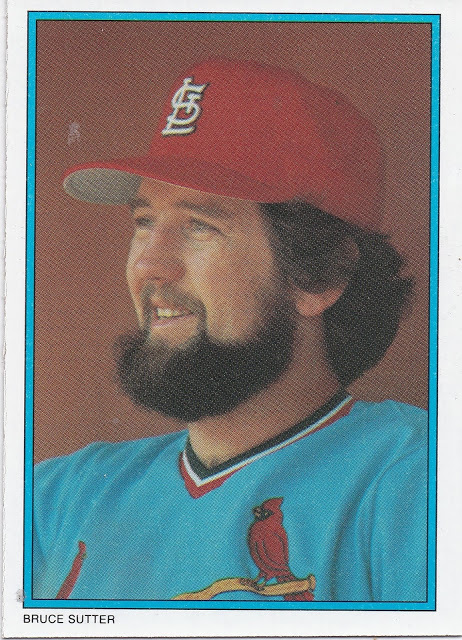 The Cardinals would later retire 42 a second time for Hall of Fame reliever Bruce Sutter. The last player to wear 42 prior to Jackie Robinson Day in 1997 was Jose Oliva, who has no relationship to Tony Oliva. He played for the Braves in 1994 and 1995, before he was traded to the Cardinals in August of 1995. The Cardinals stuck him at third base for a few games the last few weeks of the season. 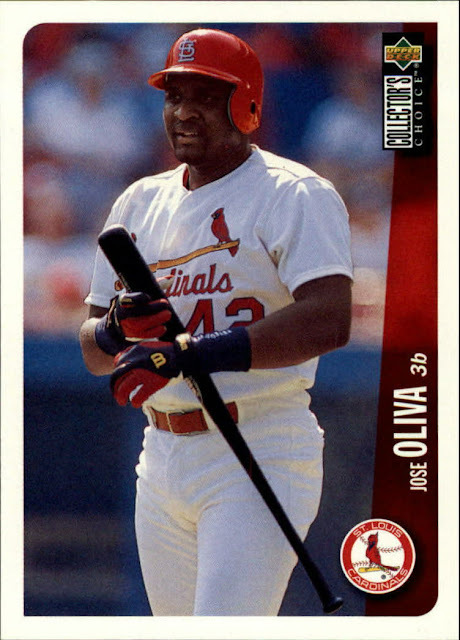 Oliva hit .122 with 2 home runs in almost 100 at bats during his time with the Cardinals. 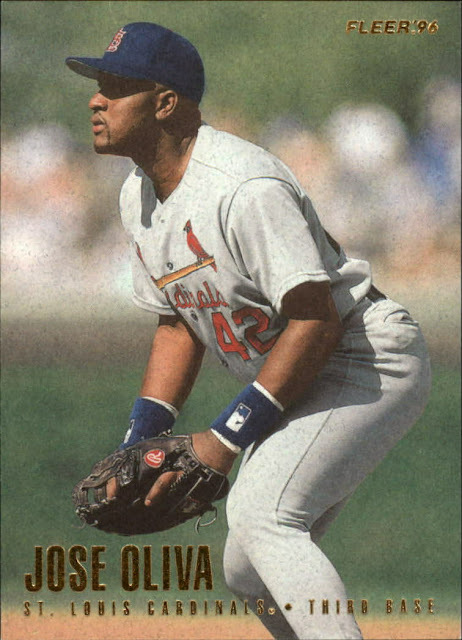 The brief stint earned Oliva a few cards in 1996. 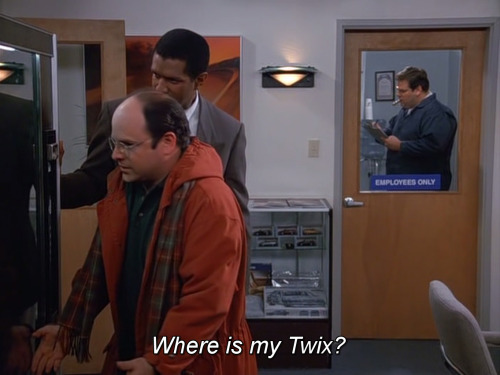 I have three of them, I know I am missing one or two. My favorite is his 1996 Collector's Choice. It's a simple card with him looking at the third base coach, or something like that. You can see the 42 on the front of his jersey. 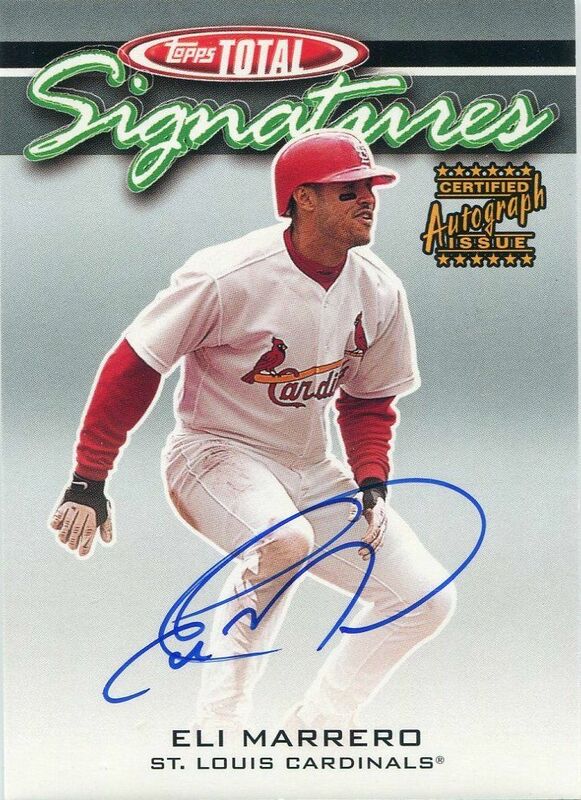 By the far the best picture on any of his Cardinals cards. This is my least favorite card of Oliva. Who puts a check swing on a baseball card? Donruss. Did I mention they went bankrupt? It feels a little lazy to make a card of a player with this type of action shot. I'd rather take the Collector's Choice card above where he is just looking at the coach. This card has a lot of potential. I want to like it more than the Collectors Choice. The photo is clearly taken in Wrigley Field, but I don't love that the ivy walls in the background are blurry. I thought the picture of Oliva might actually be airbrushed. He did play a game with the Cardinals against the Cubs in Wrigley, but his hat looks off. Still think this might be a Braves picture that was airbrushed. 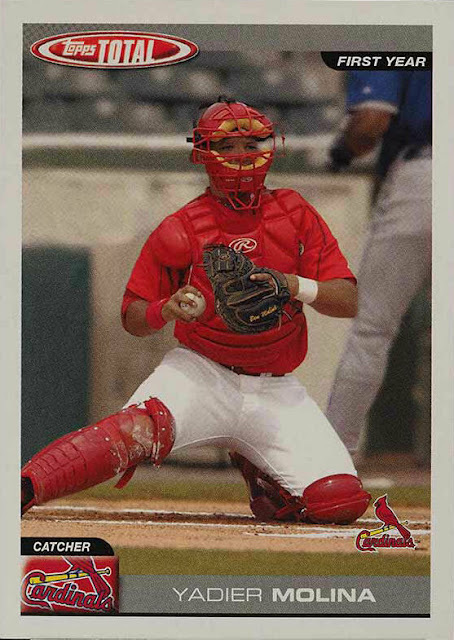 Oliva played in the Cardinals Minor League system during the 1996 season, and was out of professional baseball in 1997. He was killed in a car accident in December of 1997. Here is the 42 on the outfield wall of Busch Stadium. A quick review from the first post about Will Wilson. 1. 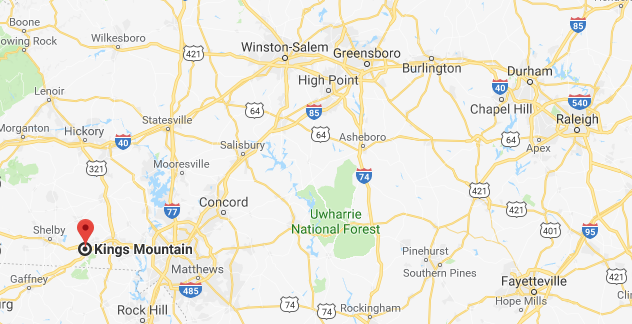 He's from King's Mountain, North Carolina, which is shown on the map below. It's west of Charlotte towards the mountains. 2. 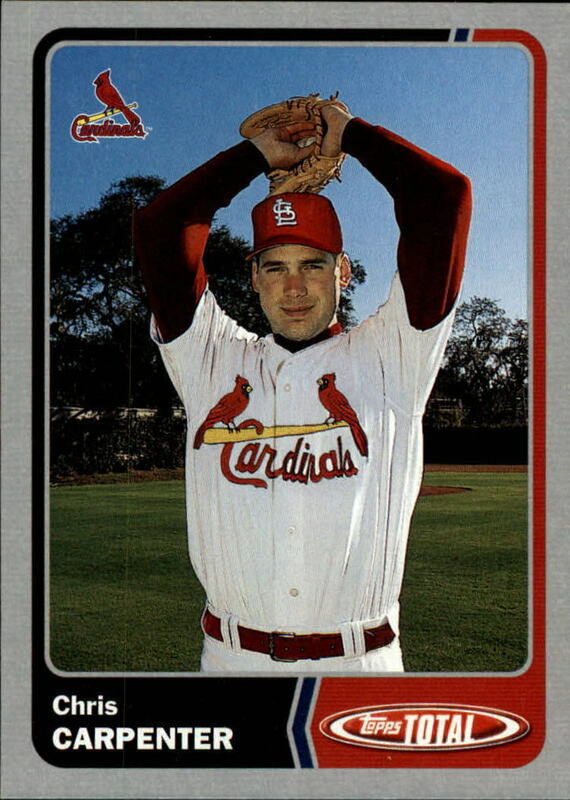 Will Wilson had a baseball card made while he was in high school. 3. Pack Pride, an NC State fan site, dubbed him "The Mayor of King's Mountain" a few years back during his freshman year at the school. The Mayor of Kings Mountain, Will Wilson, singles as the UNC LF misreads the ball. Run scores. Bases loaded with no outs in T5. Pack, 3-0. 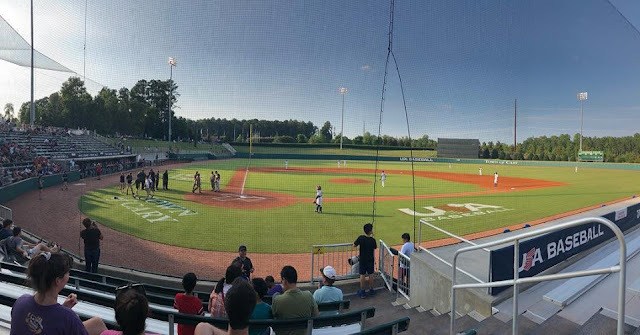 This past summer Will Wilson played for the USA Baseball College National Team, which plays mere minutes away from NC State's campus, and even closer to my house. We are all caught up. I got to see Will Wilson play last summer while the College National Team was playing Chinese Taipei. Pretty fun game to attend. More importantly, since he was on a USA Baseball team you know he is getting a baseball card at some point. Do these guys get any money for signing all of these cards, or is more just a thing that they have a card? Here is my Will Wilson card. but it is not. Just some sort of weird mark underneath the sticker. It sort of made me wonder if someone didn't put the sticker on the card, and then pull it back off because it was not straight or flat. More Will Wilson cards later. I think of Coleman as being a 1980s Cardinal, but he did appear with the team in 1990. I have done several other players from the 1990 team, which was one of the worst in the history of the franchise, who were similar in that they just spent the single season with the team. Just looking at the names on the roster, you would think that they would have at least been decent, but there were too many players who underachieved. It has been a long held opinion of many, including former manager Whitey Herzog, that half the team was playing for a paycheck in 1991, rather than playing the team oriented style that made the 1980s team successful. Some big names on that team were free agents to be. 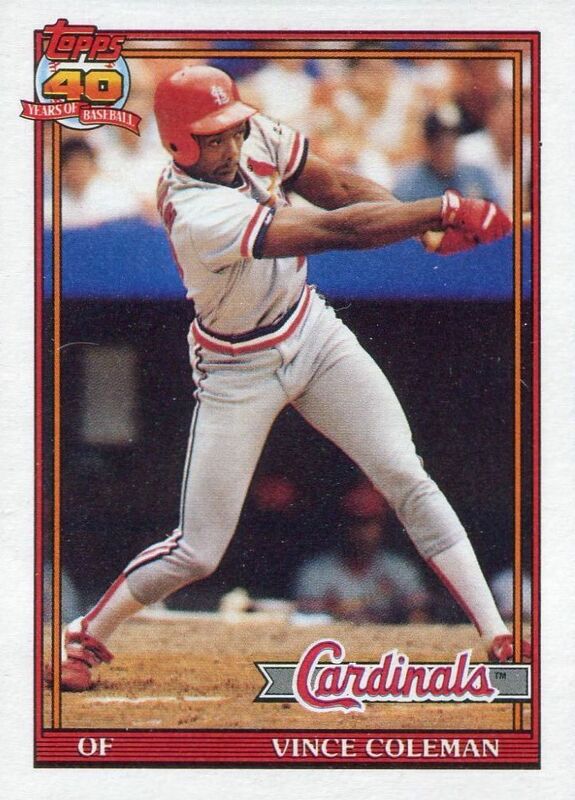 There were players like Terry Pendleton, who hit .230 with a .277 on base percentage, and had a career worst season. 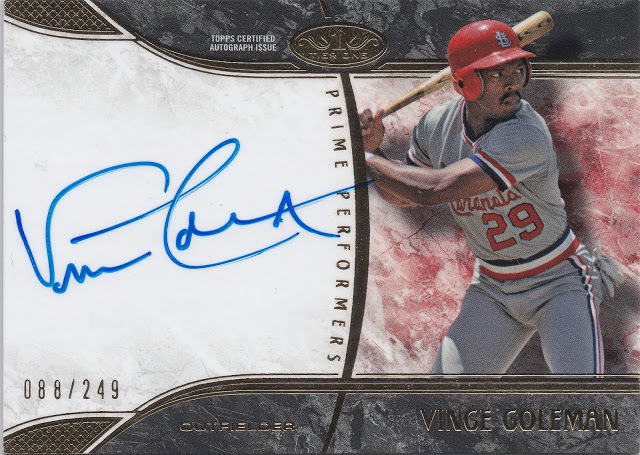 Then there were players like Vince Coleman. He set career highs in almost every offensive category with the exception of stolen bases. While the quantity of stolen bases on Coleman's stat sheet declined, he became more efficient during his later years with the Cardinals. From the middle of September of 1988 through the end of July in 1989, Coleman was not caught stealing once. In all, Coleman stole 50 consecutive bases during that stretch, which is a Major League record. Given the lack of stolen bases in the game at the moment, it's a record that is likely to last awhile. On to the baseball cards. Coleman is a name player, but only one season means that there is a limited amount of cards. 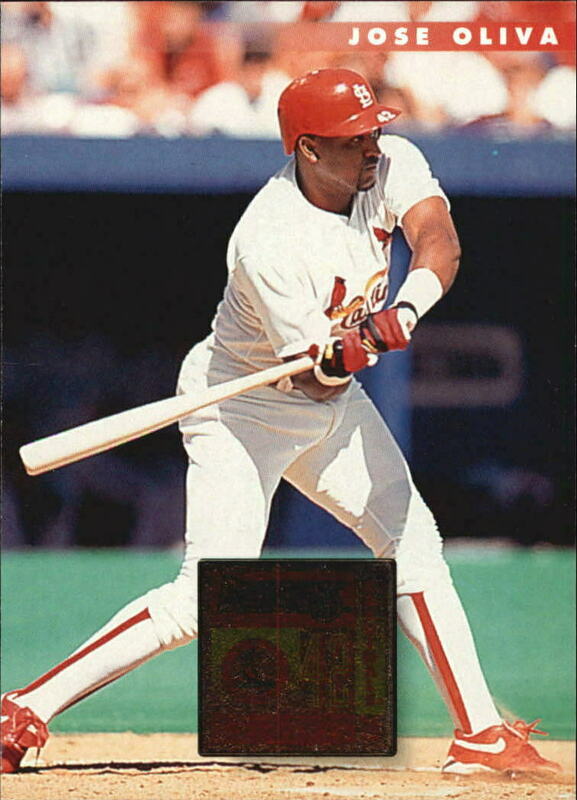 Just going with four 1990s cards for this post. His 1990 Topps Record Breaker card. This was a card for his consecutive stolen base record which was set in 1989. 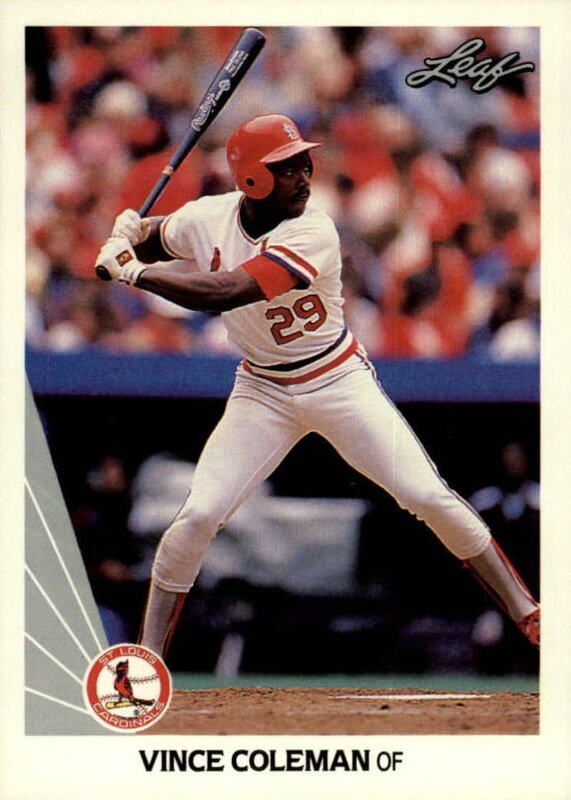 The 1989 Topps Traded set had no record breaker cards, or highlights like some years do, so this was it. The 1990 design seems to be hit or miss. People either love it, or hate it. I am fine with it, not high on my list though. Just like that a stolen base record got a highlights card. If I had to go with a plain, regular base card from 1990, I would have to choose his Leaf card. These are basically a white frame card, with that little grey thing in the corner. I like the picture of Coleman batting. In sitting down and flipping through his cards, it seems like there are not a lot of cards with him batting for whatever reason. Stands out from the rest of his cards. This is the Cardinals checklist from the 1990 Upper Deck set. 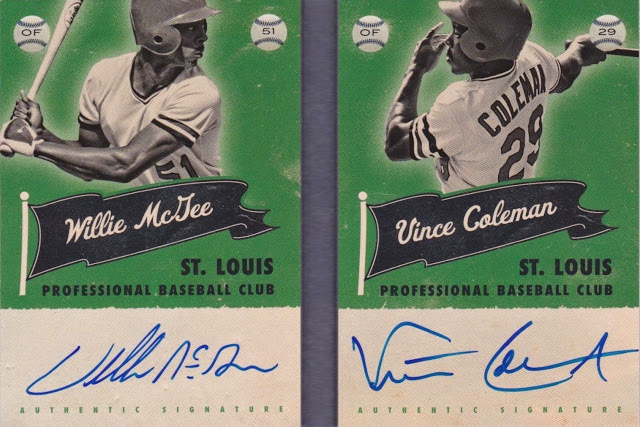 I like it better than Coleman's actual 1990 Upper Deck card. When I was a kid, everyone used to love the Donruss Diamond Kings drawings, but I think these were better done. 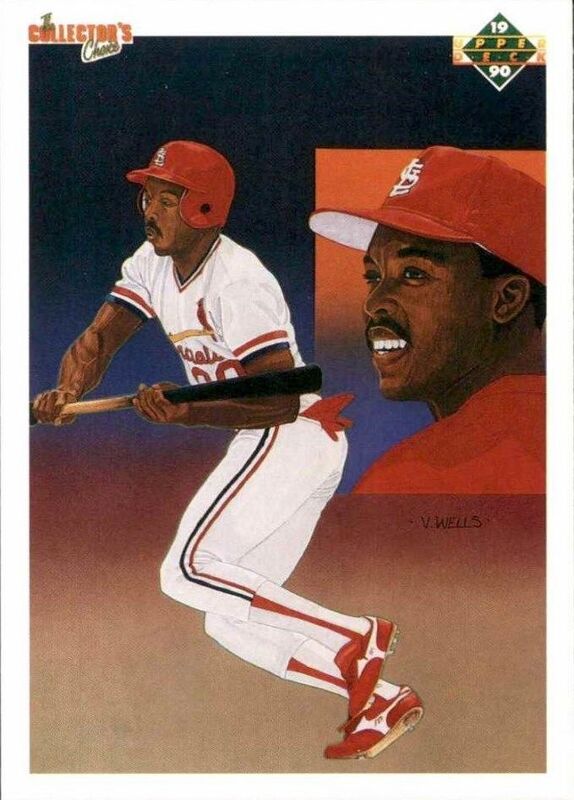 Plus the artist was Vernon Wells, father of Blue Jays outfielder Vernon Wells. 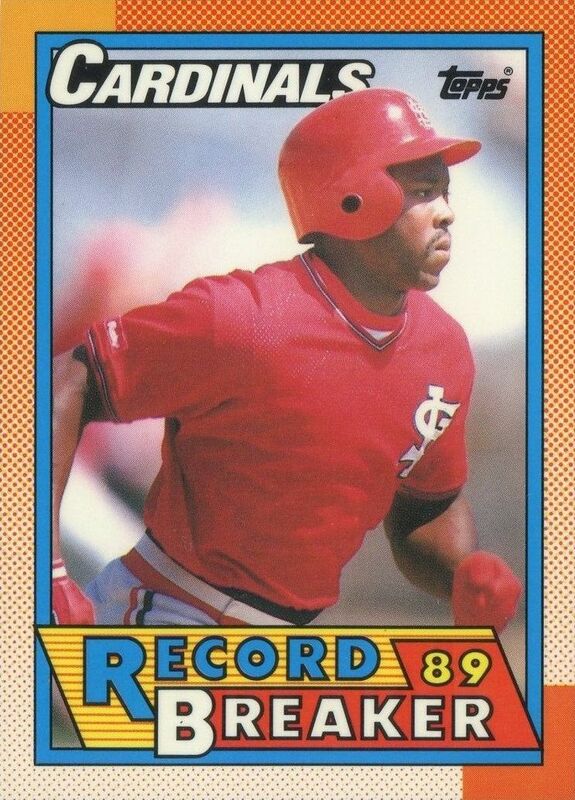 The last Cardinals card of Vince Coleman on a Topps card was in 1991 with his 1990 stats. The majority of his cards that year were as a Met, which is where he signed after leaving the Cardinals. Vince got a nice contract, but did not do well in New York. Interesting that his last Cardinals card has a picture in Shea Stadium, not sure if it was a coincidence, or done intentionally. 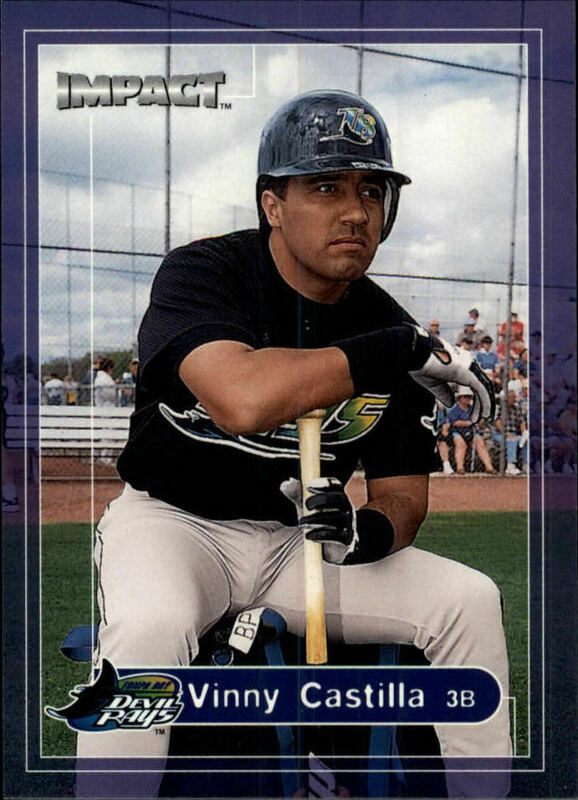 He played until 1997, and retired after a very brief stint with the Tigers. Since retiring Coleman has worked as a coach for several teams. He was also elected to the Cardinals team Hall of Fame. 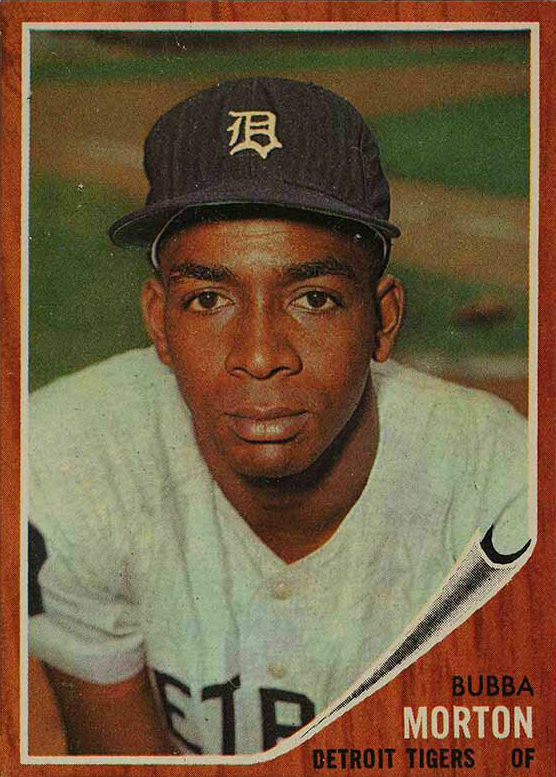 Coleman has occasional appeared on baseball cards since his retirement. His autographs are affordable, and he's got a nice signature. Definitely a high priority for me when they pop up. 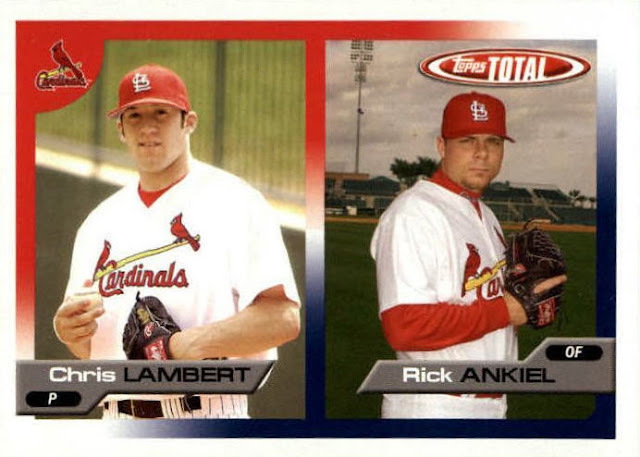 Plus, while Coleman ended up playing for a bunch of different teams during the second half of his career, all of his post retirement cards have been in a Cardinals uniform. This one above is nice, but my favorite is actually a Panini. I know, no logos. Beautiful. I was always surprised someone took the time to make this card. 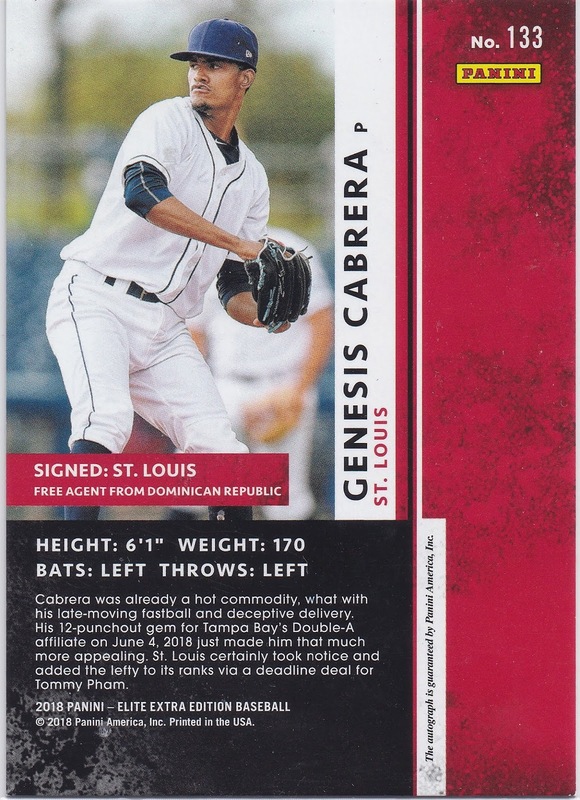 Last summer the Cardinals traded Tommy Pham to the Rays in exchange for one of my favorite Durham Bulls players Justin Williams, along with Double A pitcher Genesis Cabrera, and another Minor Leaguer. We aren't going to worry too much about Roel Ramirez. Pham has played well for the Rays over the last few months. Currently, he is in the middle of a long consecutive games on base streak. Meanwhile, Justin Williams is not playing because he lost a fight with a television set during the off-season. I still liked him from his time in Durham. I honestly think that Justin Williams is also the last Cardinals player on the 40 man roster. There are tons of outfielders on the team, and he is the worst of them. Even worse than Dexter Fowler for the moment. We'll see how much longer he's a Cardinal. Which means there is a lot riding on Genesis Cabrera to do something. Cardinals fans are relying on him to make everything alright. I picked up a few of his cards last fall. Probably my best was his Topps Heritage Minor League card, which featured him as a Double A player with the Montgomery Biscuits. Genesis has a deckle edged card, along with a few other different variations. You know the routine. I did skip over his Donruss/Panini stuff last fall. It was more expensive, and it's Panini. Sometimes all of the airbrushing really bothers me. Not to be snobby, but I like seeing the full uniforms and logos. All of it. 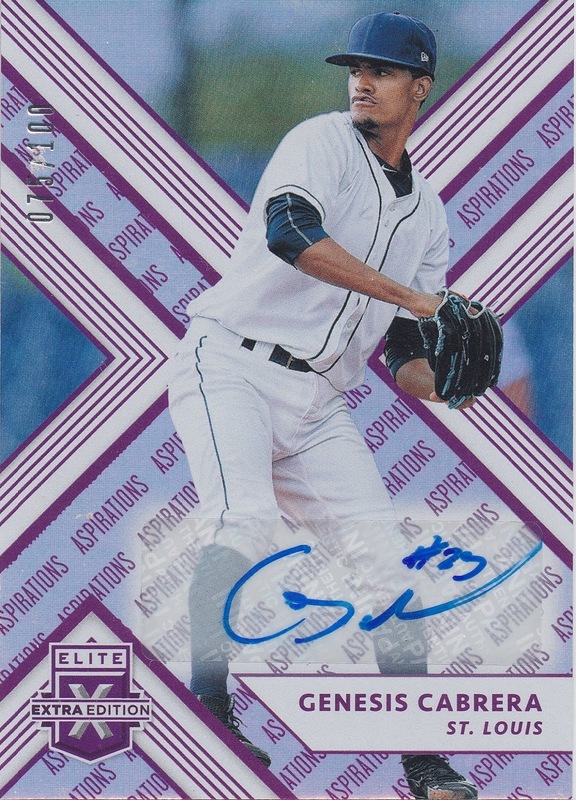 The price fell enough that I finally went out and got a copy of his Donruss Extra Elite card. The autographed version. 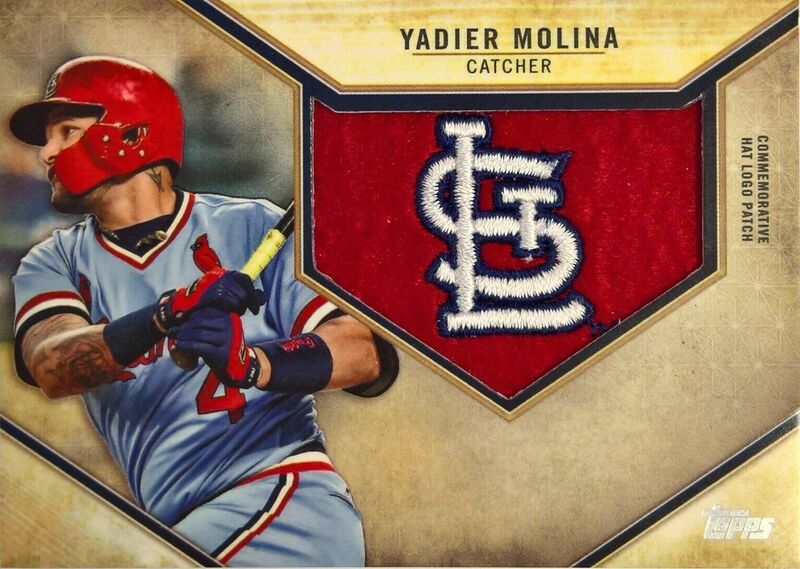 It did not look great on Ebay, but he's a Cardinal right? 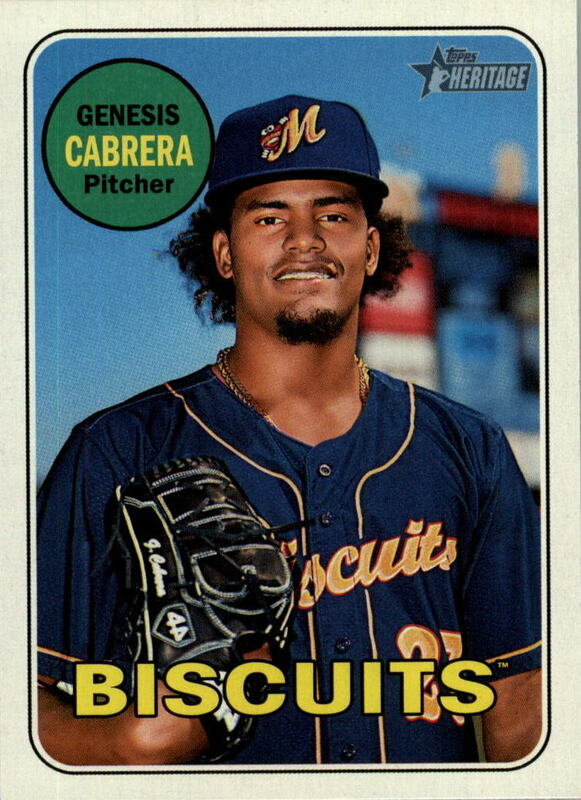 First off, this is really a card of Genesis on the Biscuits. 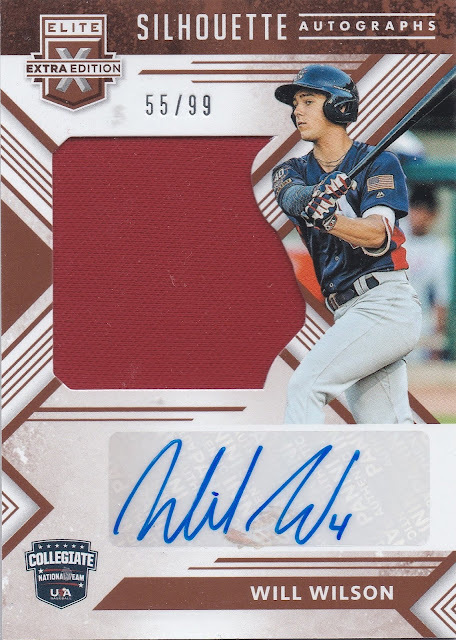 They have a pretty easy to like Minor League uniform, yet here we are with this card. I know, Panini can't do logos. The sticker autograph is also not very well done. It's obviously a sticker, not blended in very well with the card. Feel a little buyers remorse. We've got a description of his pitches, a good outing, and the details of him being traded to the Cardinals. This is going to send a little weird, but the red coloring on the back of the card bothers me more than anything else. The front of the card is purple, but the back is red? Is it because he is a Cardinal, or are all the backs of the cards colored red? 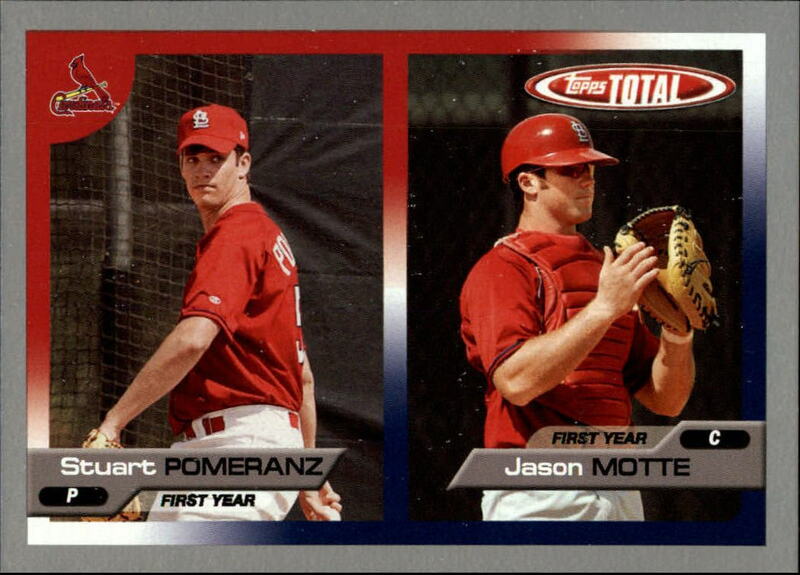 The only other cards I have from this product are either of USA Baseball players, or Cardinals. Not really sure. It would have been nice to match up the coloring a little better. Maybe just make it a card where everything ends up with the Biscuits coloring. Pretty messed up.